Location of this great event is Marmari which is located in southwestern coast of the second largest island in Greece - Evia. It is quiet seaside destination with marvelous beaches and plenty of choises in accommodation , food (seafood , meat, pizza etc) , coffees and romantic bars. Beginning today and for the next 8 months an online newspaper will inform you for everything about this big event with a wealth of material (documents , photo, useful informations) before , during and after the WC . Also here you can read some interesting statistics from the 19 previous tournaments. In this topic we ask you to post if you are interesting to join. Additionally you can ask everything according the event , exchange thoughts and opinions etc. DO NOT LOSE THE OPPORTUNITY TO LIVE AN UNFORGETABLE EXPERIENCE!!! Get your seat booked now! The hotel is 150 metres from Marmari Town centre, and its fish taverns, cafes and bars. The scenic port and marina are less than 400 metres away. Nearby beaches include Kokkini at 2 km and Megali Ammos at 1.5 km. Cars and bicycles can be rented on site. 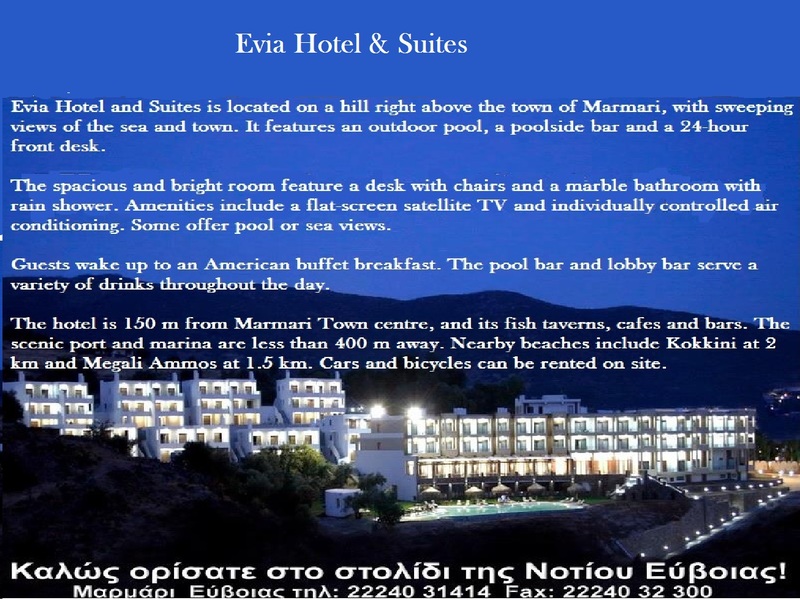 Marmari is located in southwestern coast of the second largest island in Greece - Evia. 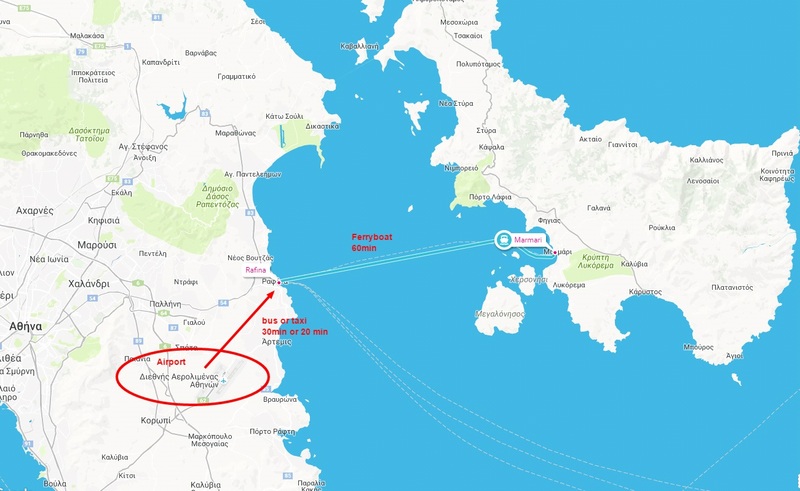 There are ferry routes with the mainland port of Rafina. According the timetable (2016) in 17th August there 4 routes to Marmari at: 8.30 , 11.45 , 16.00 , 20.30. The Athens International Airport (Eleftherios Venizelos) is 20 km away from Rafina. Αlternativelly for those people who prefer to avoid the ferry , Marmari can be reached by car. It takes 3 hours and the distance (airport- Marmari) is 207 km. This of course needs to rent a car and would be a more expensive solution. Great location, really looking forward to this amazing WC. Timing of the announcement is also perfect, first time in Stratego history all information is available already in the year before (2016). I hope to meet a lot of new and known Stratego friends in Marmari, behind the board. Edited by playa1, 06 January 2017 - 05:47 PM. History and interesting statistics of the world championship in stratego. 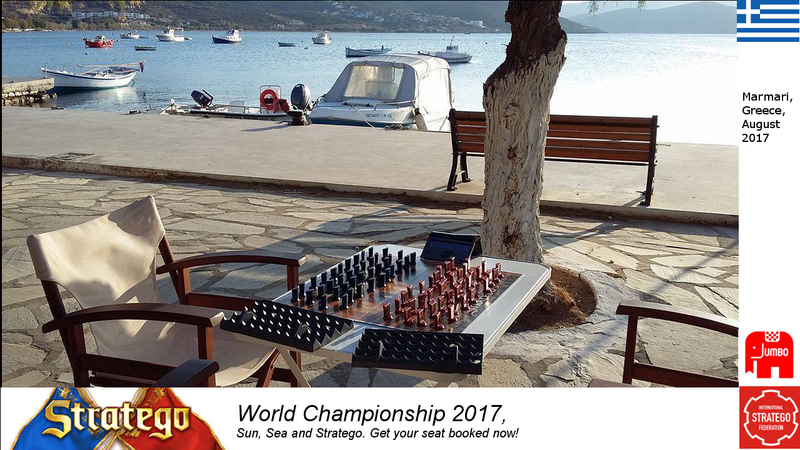 In Marmari ( Evia / Greece ) there will be held the 20th tournament. These are some interesting statistics from the previous 19 events from 1997 - 2016 There are many and interesting findings. Next with 4 times comes Belgium and Germany and follows Netherlands with 3 times . Austria , Ukraine and Greece once (this year will be the second time). - During these 19 events there are 888 participations from 15 different countries. Almost 50% of the participations comes from Netherlands and 26% from Germany. - The average participation is 47 players per WC. Biggest participation was in Rotterdam 2002 with 73 players. Lowest record was in Nort Shields 2011 with 23 players. Most countries in an event was in London 1997, in Berlin 2001 and in Waterloo 2015 . In all of these events players from 8 different countries participated. - Netherlands has won 16/19 WC . Germany ( with Annies Steffen) in 2009 , England (with Richard Ratcliffe ) in 2011 and Greece with (Stauros Sekertzis) in 2016 won the remaing 3 tournaments. Vincent de boer follow with 3 trophies. 3 players (all of them dutch) Eric van den Berg in 2006 , Vincent de boer in 2003 and Adriaansen Luc in 1998 have won the WC with only wins !!! - Biggest unbeatable streak belongs to Tim Slagboom with 23 games in a row without defeat ( 2012-2014) . 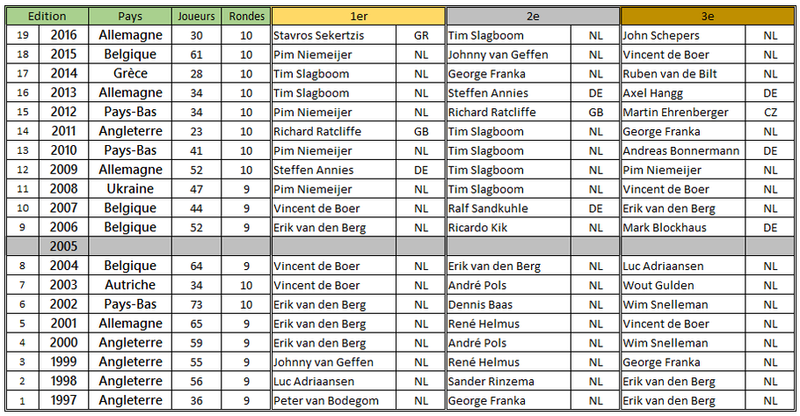 Pim Niemeijer with 12 games and Stavros Sekertzis with 11 games are currently running streaks without defeat and hope to break the record of Tim Slagboom. Tie situations in which Buchholz points determined the world champion were in 6 WC. In all the WC except 2 ( in 1999 and in 2007) there was game between the first 2 players. In these 2 tournaments there wasn't game between the world champion and the player who got the 2nd place. - The most unhappy and unlucky player should be George Franka who was involved in the tie situation in 2009 and got the 4th place despite the fact that he won all the players who took the 3 medals. WILL YOU MISS THIS EVENT? Get your seat booked now!un , sea and stratego Get your seat booked now! WILL YOU MISS THIS EVENT ? 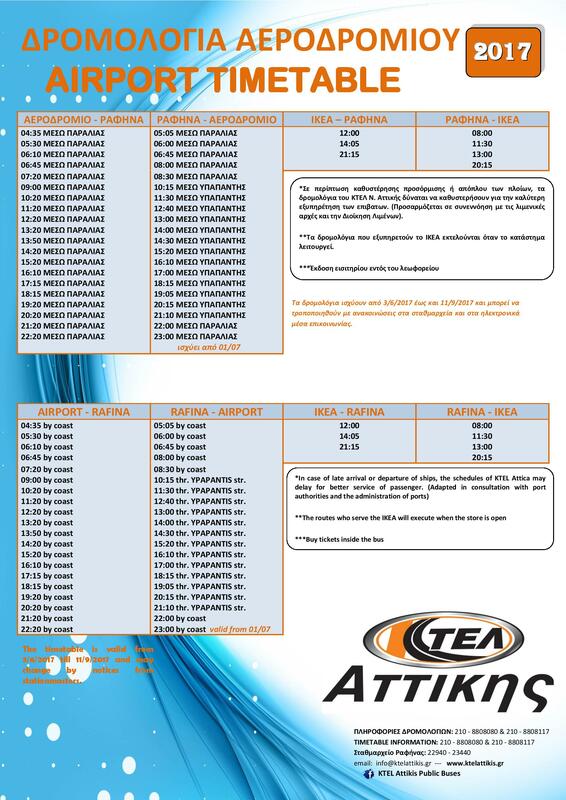 For those how want to participate to WC2017 Marmari, Evia GREECE, there are still very CHEAP FLIGHTS. The flights are for 17/8 to 21/8 and the prices are for roundtrip!! Who will be the next Senior World Champion of the 20th WC in Marmari? Which country will win the Stratego 2017 world championship country competition? add in getting to and from the airports + ferry + entrance fee and food and drinks. Wow £800 at the very least and maybe costing up to £1,000. I have been to quite a few World Championships and the average cost has been £300 to £400. I think last years was the most expensive at around £450. I cannot justify paying £800 to £1000. Too expensive. I can get return flights to the USA cheaper than the flight to Athens. Return flight to Boston for £234 or New York for £290. As you can read above before one month ago we gave some cheaper suggestion for flights (I do not know the cost today) so maybe you can search the above flights. WC in Greece was announced in 2016 ( as memmber Iin ISF you were aware from October!) when there was real cheap flights from London ( less than 200 euro) . I remind you Antony's email '' As promised the flight costs today are £ 165 which is around Euro 200 return from London. '' It is obvious that late booking costs more and this is common in all the world. The cost you mention above is for a double room with breakfast. So you can share it with another British player . Charlie has already booked his flight and hotel so maybe you can ask from Jonathan to share a room and have the half cost. In case you take a single room there is a suggestion to book in Marmary bay with 50 euro per night (including breakfast) that is 200 euro for 4 nights. Inside the entrance fee there are 2 free light meals during the seniors tournament and the mean cost for dinner is 10-15 euro and 6-7 euro . In total and in case you take a single room cost is around 340 euro / 300 £ + air tickets but if you find someone to share the room this cost can be reduced 80-100 euro / 70-90 £ . In none case cost is so expensive as your estimation , even today. There is no need to spend a night in Athens. 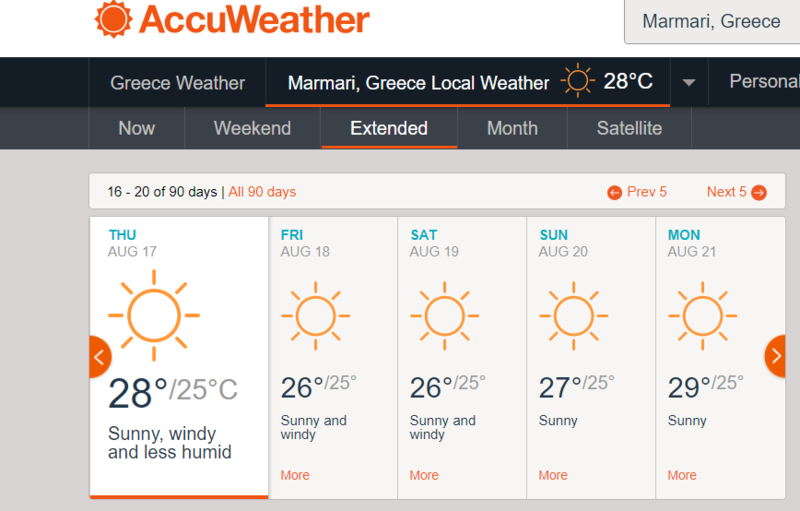 Arrival time in Athens on Thursday is 17.50 Take the bus to Rafina on 18.00 or a taxi in case you do not catch the bus . You take the ferry on 19.30. Arrival time in Marmari is 20.30. This is 30 pounds less than in a WC in Greece!!!!!! and this in case you take a single room because if you find another player from England total cost will be 40-60 pounds LESS . Does it worth to lose it for 30 pounds? or if this WC was in Waterloo this year would you join? It would be nice to have a list of participants who have confirmed their registration , to attract more people to the tournament. See you all in the WC. ** This list will be updated as soon as there are new informations. Anyone from the above list who can confirm his participation or anyone who don't find his name in this list and wish to join the WC , can contact with me via pm. If you don't already have reservations at the Evia they are booked. I suppose that you mean reservations through booking.com. This is true . Unfortunatelly since Sunday there are no available room in this site. As far as I know it is still possible to book a room but this can be done only in this email info@eviahotel.com or directly at the hotel via telephone number +30 2224031414. Have you tried to book a room? The big majority of players have already made reservations. Noone until now has informed me that he can not find a room. All the players have already informed from the official invitation https://ufile.io/pougl that they must book their room asap from April. All the players have already informed from the official invitation that they must book their room asap from April. I dealt directly via email with the hotel and they replied they are booked so this is just an FYI for those who thought they could get in. Greg tells me there are plenty of offsite hotels that are cheaper so don't let that discourage you. It's just too far for me to travel at my age. I'd love to come to Greece one day and meet all of you, but I cannot fly in coach and business class is around 4000.00. It's not just the money, it's a long 15+ hours on the plane plus layovers. I have a lot of different things I can do with that money. So may your all have good luck and great fun, but I will pass this year. Maybe I can make it next year.